David Cohan is a Building Energy Codes Program Manager with the Department of Energy (DOE). For more information on the DOE and the energy code development process, please visit http://tinyurl.com/z3g6h7k. • Building codes are state laws. The United States does not have a national building code or energy code; instead, states or local governments can choose to adopt one of the national model energy codes, a modified version of the model code, or their own state-specific code. • Energy codes are just one of many building codes, such as fire, electrical, structural, or plumbing. • Energy codes are different than appliance and equipment standards. Energy codes cover the building itself—for example, the walls/floors/ceiling insulation, windows, air leakage, and duct leakage. Appliance and equipment standards cover the things that go into the buildings. However, there is some overlap, particularly in lighting. 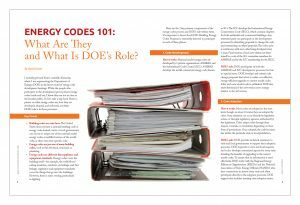 Here are the 3 key primary components of the energy codes process and DOE’s role within them. It’s important to know that DOE’s Building Energy Codes Program is statutorily directed to participate in each of these phases. How it works: National model energy codes are developed by 2 private organizations: ASHRAE and the International Code Council (ICC). ASHRAE develops the model commercial energy code, known as 90.1. The ICC develops the International Energy Conservation Code (IECC), which contains chapters for both residential and commercial buildings. Any interested party can participate in the development processes by submitting proposals to change the code and commenting on others’ proposals. The codes cycle is continuous, with new codes being developed every 3 years. Final versions of each new edition are determined by a vote of the 90.1 committee members for ASHRAE and by the ICC membership for the IECC. relative to the old version. DOE’s role: DOE develops and regularly updates software (REScheck and COMcheck) to simplify and clarify compliance with model energy codes and standards, as well as a number of state-specific energy codes. DOE also develops education and training materials that are available free and used by governments, organizations, and trainers across the country. DOE has also developed an affordable methodology for states and cities to determine energy and dollar savings opportunities associated with increased energy code compliance in single-family homes. Field studies based on the methodology have already been implemented in 9 states with more underway. The data that comes from these studies helps focus education and training programs and provides a basis for utilities and states to determine whether such programs will be cost-effective. DOE is currently developing a parallel methodology for the commercial sector.